The Mitel 6869 SIP Phone is designed for power users who demand a lot from their phones. Supporting today's high speed networks through DUAL Gigabit Ethernet ports, the 6869 offers a large 4.3" colour backlit LCD display, 12 programmable soft keys, five programmable context-sensitive keys and native DHSG/EHS* headset support. The Mitel 6869 features remarkable HD wideband audio, an enhanced speakerphone and advanced audio processing to deliver rich and crystal clear handsfree conversations. 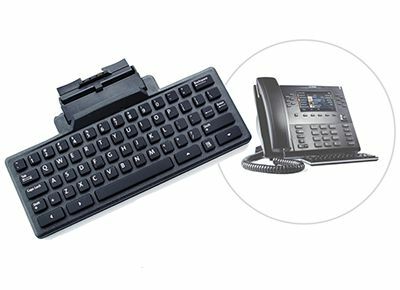 When equipped with an optional detachable keyboard and up to three expansion modules, the 6869 becomes a robust, productivity-enhancing desktop communication tool. With its fully customizable hard key layout, XML capabilities and a PoE class 3 rating, the Mitel 6869 is one of the most advanced SIP desktop phones available on the market today. 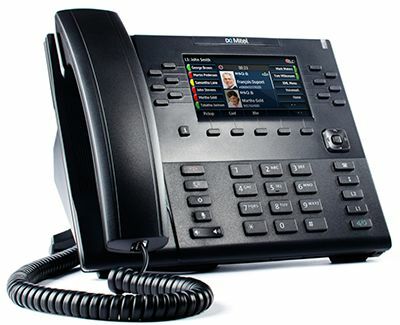 The Mitel 6869 SIP Phone features an exceptionally large high-resolution backlit LCD display that delivers a rich visual presentation to maximize productivity. The 4.3" (480x272 pixel) colour display, combined with icon-based navigation menus and an intuitive user interface, makes the many powerful telephony features of the 6869 instinctively easy to use. The Mitel 6869 SIP Phone offers USB headset support and features an innovative headset support that uniquely provides dual support for DHSG/EHS and modular 4-pin headset connections. Users with wireless headsets that support DHSG/EHS can now connect directly to the 6869 using standard third-party cables.